In short, I wrote that thoughts are real, but the issue hasn’t ever been whether thoughts are real, but what thoughts really are. The conclusion was that thoughts are just a projection, a function of the brain. They are not independent of the brain and they do not control the brain. So, is that true? Do thoughts produce proteins which change the structure of the brain? To answer that, we need to have a look at some basic neurobiology. The brain is made of nerve cells. Nerve cells have three unique structures that help them do their job. First are dendrites, which are spiny branches that protrude from the main cell body, which receive the signals from other nerve cells. Leading away from the cell body is a long thin tube called an axon which helps carry electrical signal from the dendrites, down to the some tentacle-like processes that end in little pods. These pods, called the terminal buttons of the axon, and then convey the electrical signal to another nerve cell by directing a burst of chemicals towards the dendrites of the next nerve cell in the chain. In order for the signal to be successfully passed from the first nerve cell to the second, it must successfully traverse a small space called the synapse. Despite being very close to each other, no nerve cell touches another. Instead, the spray of chemicals that’s released from the terminal button of the axon floats across a space of about 20-40nM (a nanometre is one billionth of a metre). Combining nerve cells and synapses together creates a nerve pathway, where the input signal is received by specialised nerve endings and is transmitted down the nerve cell across a synapse to the next nerve cell, across the next synapse to the next nerve cell, and on and on until the signal has reached the destination for the output of that signal. And that’s it. The entire nervous system is just a combination of nerve cells and the synapses between them. What gives the nervous system and brain the near-infinite flexibility, and air of mystery, is that there are eighty-six billion nerve cells in the average adult (male) brain. 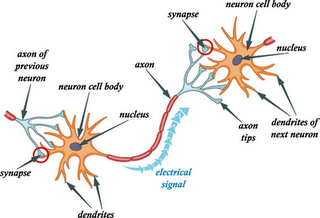 Each nerve cell has hundreds to thousands of synapses. It’s estimated that there are about 0.15 quadrillion (that’s 150,000,000,000,000) synapses throughout the average brain . Each of these cells and synapses connect in multiple directions and levels, and transmit signals through the sum of the exciting or inhibiting influences they receive from, and pass on to, other nerve cells. The brain is a highly plastic organ. When biologists talk about plasticity, they aren’t talking about the chemical plastic that we make everything out of, like plastic cups or bottles, but the ability for the cells, tissues or organs to change or adapt. And the brain does this all of the time. Every stimulus changes one or more of the billions of branches and synapses that the brain has. Branches can be pruned back, or new ones grown. Existing branches can be strengthened or weakened. Each change to the branches of the nerve cells helps the brain to adapt to the ever-changing internal and external stream of signals that the brain is required to process. 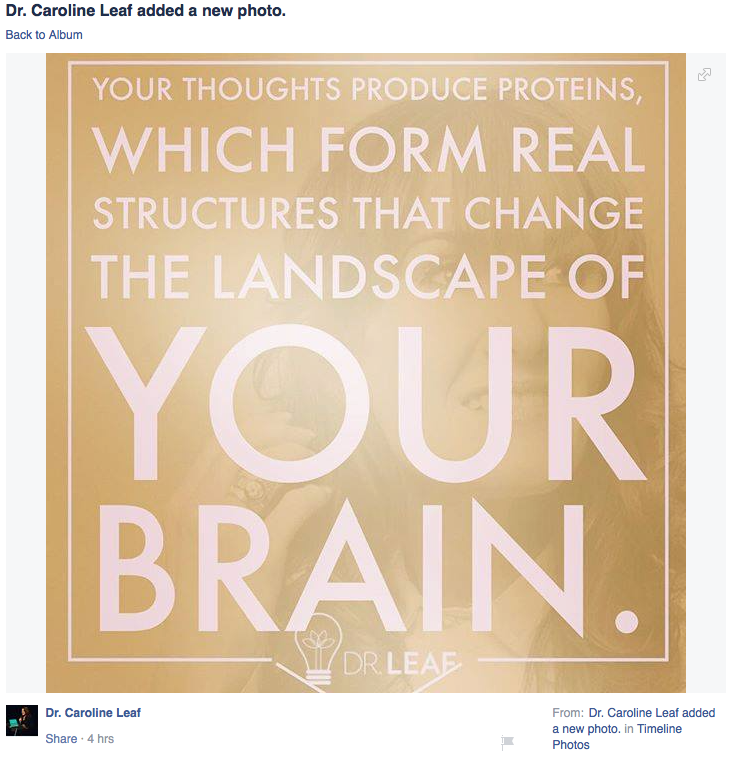 So returning to Dr Leaf’s statement: The key part of the meme is, “Your thoughts produce proteins”. This is where Dr Leaf’s statement is wrong. The error is deceptively subtle, but it’s still wrong. When changes are required, new branches are formed, which do indeed require new proteins. But most brain function, including our thoughts, is simply electrical current running along the pathways already formed by the branches of our nerve cells. Even then, our stream of conscious thought is only a tiny fragment of the billions of nerve impulses our brains produce each and every second of our lives. As I described in my previous post, thought is not dominant. Our thoughts do not control our brains, it’s our brains that control our thoughts. Thoughts are real, but they’re real like an image on a screen is real, but isn’t the real thing. Thoughts are only significant when they are considered for what they truly are. Our stream of consciousness is simply a selective place of refinement for highly salient parts of our non-conscious information that need further processing before further action is taken with that information. They are like the dials on your dashboard, which give selective important information about the car but they don’t control the car. Thoughts do not control our brains growth, or alter our brains architecture. As it is, Dr Leaf’s meme creates a false impression that our thoughts are the critical factor in determining our brains structure and function, when the reality is the exact opposite. This entry was posted in Biological, Caroline Leaf, Psychological and tagged brain, caroline leaf, cognitive neuroscientist, criticism, dr caroline leaf, Facebook, meme, nerve cell, neurobiology, neuron, synapse, thought by cedwardpitt. Bookmark the permalink.